Manager Keith Curle is relishing Saturday's visit of promotion-chasing Exeter City, describing it as an opportunity for his Cobblers team to 'test ourselves' against one of the league's top sides. The injury-hit Grecians are currently fifth in Sky Bet League Two, nine points adrift of automatic promotion and only one inside the play-off places. 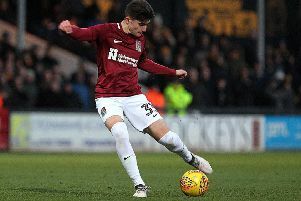 Northampton and Exeter were separated by 16 points less than a month ago but that gap has come down to 10 ahead of Saturday's game, with the Cobblers unbeaten in five matches and City winning only once during the same period. The visitors are also plagued by injury problems, but Curle believes they still represent a stern test for him and his players. "There's nothing better than going back home against a footballing team in Exeter who are at the other end of the table where we want to be operating," said the Town boss. "It's a good opportunity to test ourselves against a team that are chasing to get out of this division. They are where we need to be and that's where we want to be. We've got aspirations to be in that position next season so it's a great opportunity to test ourselves."